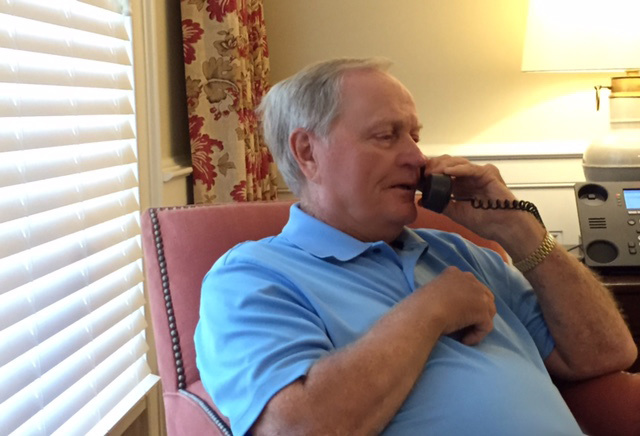 Jack Nicklaus began Wednesday of Masters Week with a morning interview on ESPN’s hugely popular “Mike & Mike” show. Listen to the replay on ESPN.com or read the transcript below. MIKE & MIKE: Joining us now from Augusta, six-time Masters champion Jack Nicklaus is back on the show. Jack, it is always our pleasure. How are you this morning? JACK: Good, Mike. How are you doing? MIKE & MIKE: We’re doing great. We had Gary Player on earlier this morning as well. Obviously, this year will be a little bit different for the two of you, who have been going back to Augusta all these years as defending champions and for so long now have been a part of those Opening Ceremonies. How will this year, would you imagine, be different for you, and how has the experience been different since the passing of Arnold Palmer? JACK: Well, obviously we’ll miss Arnold. I think everybody will miss Arnold. But, you know, life goes on. Gary and I will take the first tee. I’m sure the ceremony will be good. We’ll have a good time. We’ll hit drives. We’ll find out who’s going to hit the longest drive—that’s Gary’s biggest deal. He said he won his fourth Green Jacket last year when he outdrove me. So, he wants to win a fifth this year. MIKE & MIKE: Just like in golf on a lot of shots on a lot of holes, do you guys ever have a little wager on the longest drive? JACK: No, it’s just bragging rights. Gary works pretty hard at trying to keep himself fit and so forth. I have to say I’m not quite that way. We have a lot of fun. We’re good friends and we like to kid each other a lot. MIKE & MIKE: I have to ask, because I’m always so fascinated by the dynamic of the great rivalries of Ali and Frazier, of Chamberlain and Russell, Chris Evert and Martina Navratilova, and just that relationship over the decades. You and Arnold Palmer—your names will always be intertwined—competed against each other for decades and decades. I just wonder, now that a little bit of time has passed, as you reflect on that, how do the memories come to you now? JACK: Well, obviously I miss him. Arnold and I started competing when I was 18 years old and Arnold was 28 years old. We played an exhibition together. We ended up having a driving contest and I won the driving contest, but he reminded me that he shot 63 and I shot 67. That was the start of our competition, and it never ended. We had fun with it. We enjoyed it. We would go out and try to beat each other’s brains out. We’d shake hands at the end of the round and then Barbara, Winnie, Arnold and I would go have dinner. We had a great time. We traveled across the Atlantic many times and played bridge all the way. There were all kinds of things that we spent time doing together. We were close friends. The big thing that Arnold and I had was that we were competitors, but we always had each other’s backs any time it was time to have that. MIKE & MIKE: You mentioned the word “dinner,” so I have to go here. You had the Champions Dinner last night and you certainly have been to a number of those. For those that may not know, the winner of the Masters picks that dinner for the next year’s Masters. I would imagine, Jack, there’s been a few of those dinners where maybe you didn’t like what was selected by some of the winners. JACK: [Laughs] Well, they always have something. Sandy Lyle had haggis. I think that somebody might have had boerewors from South Africa. Gary Player might have. I think we had Argentine beef. You know, all kinds of things. But they always have steak, fish or chicken if you want the choice. But it’s kind of nice, we have an international flavor to it. Okay, now let’s go to the next thing, because with golf, I’m always so fascinated by the psychology. So Jack, I’m sure you had moments like this. Take us to Jordan Spieth and what will be on his mind when he walks to the 12th tee Thursday, Friday, and maybe most significantly if he’s in contention on Sunday. JACK: Well, I think that everyone thinks about what happened at Hole No. 12 last year, but I don’t think Jordan will. He’s a smart kid; he’s got his feet on the ground; he’s a great competitor; he’s won here at Augusta. He got a bad break last year and it cost him the tournament and he’ll learn from that. He won’t dwell on it—he’ll learn and he’ll move on. Next time he gets in that situation, he’ll say, “Okay, we’re going to put it right in the middle of that bunker and we’re not going to worry about anything else but getting the ball over that water and putting ourselves in play.” Even if you make 4, you don’t hurt yourself there that much. As a matter of fact, when I won in 1986, I ended up making 4 there and down the stretch. The 12th hole can kill you, but you just have to get by it. I think that there’s a half a dozen shots in this golf course that you just have to get by. And if you do get by those six shouts, I think you could probably do pretty well… the tee shot at 2, the second shot at 11, the tee shot at 12, the first and second shot at 13, and the second shot at 15. If you don’t let those things build a big score for you, you can usually play this golf course pretty well. It’s just a matter of discipline and I think Jordan’s got great discipline. He’s a great kid and he’s a great player. He’s going to win a lot of Masters. MIKE & MIKE: Staying on that mental side of it, my sport of football, you always tell the cornerback if they get beat by a wide receiver, you have to forget about it because there’s the next play. And now we’re talking about the same thing in golf. Forgetting what hole or the Masters or anything, if you hit a bad shot, you have to forget about it and move on. It seems to be way easier said than done. Is it? JACK: Well, I think it’s a little easier said than done, yeah. Generally speaking, I always took it and used it as a learning experience. When I did stupid things, I analyzed why I did those stupid things, and I went and learned from it. I’d say, “Okay, now I’m back in this position again. That was a stupid thing I did last time. I’m not doing that anymore. This is the way I’m going to do it. I’m going to do it smart.” You learn from it, you build on it, and you become a better player because of it. MIKE & MIKE: Another thing, we brought it up with Gary Player as well. He said that you and he had discussed it, was this issue that came in over the weekend with viewers calling in when they see a rules infraction in the sport. It actually impacted the outcome of an LPGA major over the weekend. This is a phenomenon. We have seen it happen before. What is your perspective on it? JACK: Well, I saw the replay. I didn’t see it live. Lexi obviously made a mistake, I don’t think she did it on purpose. I mean, good gracious—it was a 12-inch putt. She wasn’t going to miss the putt anyway, so she certainly wasn’t trying to take any advantage. It just happened and she wasn’t thinking. Yeah, she made a mistake so she should get penalized for it. But to have it happen the next day, I think that’s ridiculous. Personally, I’ve always felt that once the day is over, the round is over. It’s in the books, forget it. Nothing should carry to the next day. I guess you guys are showing it now where she moved it and put it back on the wrong line. But anyway, it just happens. I mean, the thing with Dustin Johnson last year at the U.S. Open. It was still the same day, but they waited until six holes to even tell him they were going to review it. And then they didn’t review it until after the round. That’s not fair to player, it’s not fair to his or her competitors, it’s not fair to the gallery, and it’s not fair to the television audience. It’s just not fair to the competition. It’s just not something that I don’t think should happen. I think once the day is over, it’s over. I think the television viewer thing is ridiculous. You’re on-site and you’re trying to do the best you can. Do we make mistakes? Sure, we make mistakes. Do we try to make mistakes? No. If a guy is actually cheating, I think that’s going to come out anyway, and I think you’re going to be able to take care of that internally. MIKE & MIKE: One other thing we chatted with Gary about. While Tiger Woods was at the dinner last night, he’s not playing. And it’s been awhile since he’s been competitive, we all know with the injuries that he’s had. What’s the talk now with him? It’s been a long time since he’s been really competitive consistently. So when you see him now and others see him now, what’s the talk between you guys and Tiger at this point? JACK: I usually sit next to Tiger at the Champions Dinner and I did again last night. We talked quite a bit and he said he’s hurting. He said it’s not all the time, but every once in a while he gets this sharp pain and he just can’t do anything with it. He’s pretty frustrated and I can understand that. I think all of the guys are going to give him a helping hand, which I’ve tried to do on a couple of occasions. Last night, I offered him one and he said he’d take it, so we’re going to see what happens. I think he’s such a talented athlete. He’s a heck of a player. I’d hate to see him not be able to play. All players never want their records to be broken, but we certainly don’t want them not to be broken because a fellow can’t play and is not physically able. That’s not the way to do it. If Tiger is able to break my records and come back, I want to be the first one to shake his hand and say, “Well done.” That’s the way I feel about it and I hope he comes back and plays. MIKE & MIKE: What can you tell us about the suggestion that you gave him? JACK: It’s just something privately that we talked about. We’ll just see what happens. Hopefully, Tiger will get better. I don’t know whether anybody else can help him, I think the doctors are probably on top of it. A lot of things with guys is that once it’s in your body, it’s in your head, too. So you have to get it out of both of them.